Garmat is Twice as Nice! Garmat’s Dual Bay Frontier offers all the performance of a Frontier Modified Downdraft Spray Booth with twice the throughput capabilities. A space saving design with the mechanical built into the roof, this unit features Garmat’s patented air flow methods. As with all Garmat standard line of products, it is equipped with a dual inlet reverse incline fan on the exhaust, giving you the air flow and performance you expect from Garmat. Standard models offers curtain fronts, but fully enclosed models are available. Garmat Modified downdraft spray booths filter area than competing brands! 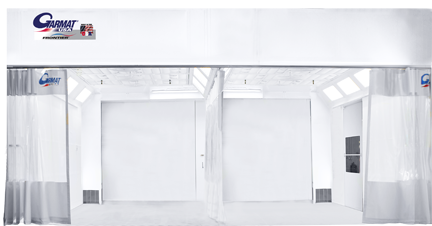 Garmat USA spray booths offer the most effective airflow in the market. Engineered with production enhancing features that help increase your throughput while decreasing your operating costs. High efficiency throughout, whether it be incorporated in the actual operation of the spray booth or simplifying maintenance to ensure continued optimal performance. Spray: Air is heated prior to passing through the cabin ceiling filters. Flash: Allows for elevated temperatures for the flashing between coats. Reduce your fuel costs with recycle on bake. Up to 90% of the heated air is recycled back into the paint booth during the bake cycle, decreasing fuel costs and ultimately saving on overall operating costs.